Making infographics is a highly useful skill. Done right, infographics can be a great way to make sense of complex data. The best infographics transform complex information and data into graphics that are both easy to grasp and visually appealing. The only problem is, infographics that look like they were simple to make are often anything but. Here, we've selected our top tools and apps for making infographics – we've included a load infographic makers that are free, or have a free option, and also some premium-only choices. Some of the selections are even suitable for non-designers, as templates and other features make them easy to use. Give these free infographic tools a try and let us know which ones you get on with by sharing your best infographics on Facebook, Twitter or Instagram. Kicking off our list of free infographic tools is something a little different. Biteable gives users the chance to create high quality video infographics for free that can be shared on Twitter, Facebook and YouTube. As well as providing engaging and high quality image assets for creatives to work with, Biteable also offers soundtracks to really make your creations sing. With plenty of designs and pre-made scenes at its disposal, Biteable removes the barrier to entry that so often stops people from using videos to their full effect. Thanks to its interactive, real-time tools, MURAL allows anyone to think like a designer and act like a designer. As an infographic tool, MURAL is more internally based, allowing teams all over the world to ideate with imagery and collaborate more efficiently. Users can express ideas with smart inking on the Windows app, draw freely for a full whiteboard experience. and share sticky note feedback with team members so everybody is kept in the loop with the progress of a project. If your team needs to collaborate and share data in a visual way, MURAL could be the tool for you. As well as a photo editor and collage maker, BeFunky includes an infographic maker. Select a template, customise your theme with images and icons, and personalise the infographic by adjusting the text, colours and layout. Then, simply save and export. Easy peasy. Visme promises to help you 'speak visually'. You can use it to build presentations, but it's especially geared towards creating engaging infographics. This free tool includes over 100 free fonts, millions of free images and thousands of quality icons, and there are options to include video and audio (including the ability to record a voiceover directly in the editor, which is handy). You can also animate your content to make things clearer. 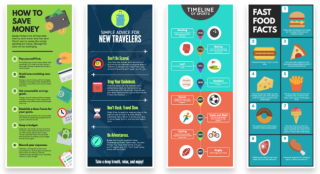 What sets this tool apart from the rest on this list is that Visme allows users to whip up an infographic in a few minutes, thanks to a library of pre-made assets that can be easily dragged and dropped into place. This allows even non-designers to display their data visually. Visme also gives users the ability to create interactive and animated infographics, making their stats and figures sing like never before. Cacoo is a cloud-based infographic maker, and as with any cloud-based tool its major plus point is collaborative working. Cacoo's interface allows teams to create, edit, and deliver high-quality diagrams together online, in real time. The application offers a diverse library of templates and shapes to help you put together beautiful visuals quickly and easily, with everything you need to create flowcharts, wireframes, network diagrams, org charts, and more available through the user interface. You can also share your infographics with team members and clients if they don't have a Cacoo account, and integrate Cacoo with other productivity tools such as Google Drive, Adobe Creative Cloud, and Confluence. Snappa is a graphic design tool that includes a free infographic maker. This one is aimed at non-designers. You won't have the kind of control on offer with some of the other tools on this list, but it does promise you will be able to 'whip up' an infographic in 10 minutes or so. Snappa offers preset templates that are optimised for social sharing on the web. There's a simple drag-and-drop interface, and access to thousands of hi-res, royalty-free stock photos. The free plan gives you five downloads per month and two social accounts, or you can upgrade for features such as unlimited downloads, custom font uploads and Buffer integration. It features a dedicated infographic maker that you can use for free, with hundreds of free design elements and fonts at your fingertips, and many more premium elements that you can buy for $1. You can either use it in the browser or download the Canva iPad app to design on the move – which is also now also available for Android phones/tablets. Google's chart tools are powerful, simple to use, and free. You can choose from a variety of charts and configure an extensive set of options to perfectly match the look and feel of your website. By connecting your data in real time, Google Charts is the perfect infographic generator for your website. Piktochart is an infographic and presentation tool that enables you to turn boring data into engaging infographics with just a few clicks. Piktochart's custom editor lets you do things like modify colour schemes and fonts, insert pre-loaded graphics and upload basic shapes and images. Its grid-lined templates also make it easy to align graphical elements and resize images proportionally. There's a free version offering three basic themes, a Lite pricing plan for $12.50 or $15 per month (billed annually or monthly) or a Pro account that costs $24/$29 per month. There's also a Pro team option for up to 25 users – the price varies depending on the size of the team. When you're happy with your infographic, you can publish it to the Infogram website for all to enjoy, embed it into your own website, or share it via social media. The 5-tier pricing structure starts at Basic (free forever) and has a 24 per cent discount on the paid-for options when billed yearly. It moves up the scale with Pro ($19/mo), Business ($67/mo), Team ($149/mo) and Enterprise (priced on request). Mind the Graph specialises in scientific infographics, but its tools can be used to create illustrations to complement most forms of data outside of scientific papers. The online infographic maker provides various infographic layouts that can be used straight out of the box to design many types of visual illustrations. Venngage is a great tool for creating and publishing infographics because it's so simple and easy to use. You can choose from templates, themes, and hundreds of charts and icons as well as uploading your own images and backgrounds, or adapt a theme to suit your brand. You can animate them too. For map-based infographics, you need look no further than Kartograph. Kartograph is a free design tool that makes illustrative and interactive maps, created for the needs of designers and data journalists. The application doesn't require Google Maps or any other mapping service, making it a simple and lightweight framework – and there are a variety of map types to suit your needs. Here's something a little different. If you're bored of static infographics, why not liven them up a bit with some motion? Animaker is a tool dedicated to the creation of video infographics, and the company says its service is exactly 10 times better than other online animation video editing software. It offers plenty of resources, including charts, icons and maps, to help you make your data much more interesting and easy to digest. You can create up to five two-minute SD videos a month for free, or upgrade for more, longer, and higher quality video infographics. There's a huge discount for annual billing with Animaker; Personal is $12/mo when billed monthly or $19/mo billed annually. Startup is $19/$35 and Business costs $39/$59. It was only a matter of time before an infographic ‪resume generator turned up. With this tool, you can visualise your creative resume in one click and also take a look at previous examples. The idea is to enable people to express their professional accomplishments in a simple yet compelling personal visualisation. While infographic resumes aren't right for every situation, for certain cases, they can be a great option. The free option includes 60 images and 10 fonts, or for $4 a month you get a much wider pool of resources, plus boosted security options and – if you need it – design help. Adioma offers users a range of generative templates: you pick a basic template (such as timeline, grid, or cycle), then the infographics build themselves around the text you supply, and adjust as you add or remove information. That means you don't have to spend time adjusting and realigning your infographic. There's also a template switching feature that enables you to compare how the same data would look in different formats. This infographic building tool includes a range of templates, large library of icons and colour palettes, and you can also upload your own images and icons to work with. The more expensive options include an expanded resource library, improved download options and the ability to upload more of your own content. PicMonkey is an online image editor with a section dedicated to designing infographics. Choose from the selection of templates, and customise the content with PicMonkey's library or by uploading your own images. There's also a selection of tutorials to help you out, focusing on things like how to design an infographic tailored to sharing on social media, and how to use grid theory to create a polished design. Watch out, though – it relies on Flash, so you might need to change your browser settings to use it.